Based in the seaside resort town of Worthing in West Sussex, on the south coast of England, Bowers & Wilkins has grown, through its 40-year history, into the worlds largest maker of specialist hi-fi loudspeakers. Besides a brand-new factory, a large and well-equipped research facility operates as a separate unit a few miles away. The latter is undoubtedly a major reason for the success of the entire operation. B&W effectively redefined upmarket loudspeakers when it launched the Nautilus 800 series back in 1998. Seven years on, the company has decided its time to revamp its 800 line. But do the new models have genuine new substance, or is this just a headline-grabbing marketing exercise, change for the sake of change? The new 800 models dont look all that different from their predecessors, but, as was pointed out at the launch, todays Porsche 911 doesnt look much different from the succession of versions the company has made going all the way back to the 1960s. B&W saw no sense in substantially changing the appearance of designs that were originally conceived on the principle of form follows function -- indeed, it would be hard to detect the changes from across a crowded room. Even a side-by-side comparison would prove tricky, even though, according to B&W, something like 90% of each new speakers ingredients have been changed. Each of the earlier Nautilus 800 models has a direct equivalent in the new range, but B&W has dropped "Nautilus" from the name and added some new, home-theater models. There are now seven different 800 speakers that are sold in pairs, alongside a number of center, surround, and subwoofer models. The 802D is two rungs below the new top model, the 800D, and one below the 801D. All three are three-ways, with essentially the same midrange and treble arrangements, and differ mainly in the way the bass is delivered: two 10" woofers with massive magnets drive the 800D, the 801D has a single 15" cone, and the 802D has two 8" woofers, which should be ample for most normal rooms. 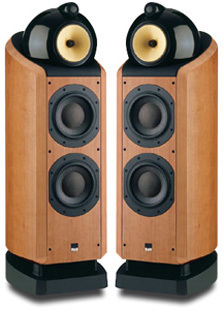 At $12,000 USD per pair, the 802D is also considerably less expensive than the others, which is a nice bonus. But while the Ds are the élite, dont write off the S models. I recently tried the little stand-mount 805S, and its a honey. I compared it to its ancestor, the Nautilus 805, and to its immediate predecessor, the superior Signature 805; it was comfortably better than both, even without the diamond dome. That aside is not entirely irrelevant. B&W has introduced two key changes in the way all of its tweeters, both S and D, operate, that are arguably of equal importance in upgrading the new speakers sounds beyond those of their Nautilus predecessors. The tweeter domes now have an improved surround/suspension system that both improves control and lowers the fundamental resonance. That in turn allows the tweeters to be fed by a gently sloped first-order crossover network consisting of just a single capacitor (plus level-adjusting resistor). Such simplicity improves the sound quality per se, and permits the use of a very costly, high-quality capacitor made by German supplier Mundorf. Then theres that dome of synthetic diamond. Its "grown" using a technique called vacuum deposition, after which it must be formed and fettled into the right shape for creating the tweeter itself. Its not much to look at. Theres no multihued sparkle, or even a nice shine to impress friends and neighbors: instead, a rather dull, matte-gray surface lurks beneath a magnetically affixed cover of protective mesh. On my samples these covers were removable, though I gather B&W is considering fixing them permanently in place. The diamond diaphragm is plenty strong enough to withstand heavy regular use for years on end, but poke it with a finger and it could shatter, leaving the perpetrator to face a $1200 replacement fee. I left my covers on for the duration. Diamond is the hardest material known to man, with the best stiffness/density ratio. This makes it good for tweeter domes, as it pushes the domes breakup resonance up to the highest possible frequency, far beyond the limit of human hearing, generally accepted as around 20kHz. According to B&W, the diamond domes ultimate resonance is 74kHz, more than an octave above the 29kHz recorded for the aluminum equivalent, and its ultrasonic behavior is smoother too, exhibiting superior self-damping. The 802D continues B&Ws long tradition of externally mounted tweeters. This one occupies its own tube-loaded nacelle atop the main enclosure. The nacelle is only slightly larger in diameter than the dome itself, which ensures that the domes output is distributed and dispersed as widely as possible. The tweeters neodymium magnet is very compact, leaving the area behind the dome relatively free from obstructions and allowing the sound radiated from here to be absorbed by a long transmission-line tube. The whole tweeter assembly is encased in a substantial alloy tube, finished in high-gloss black and mounted via a lossy rubber gasket that mechanically isolates it from the rest of the speaker. While that diamond tweeter may be its marketing highlight, this interesting and complex design offers plenty more to talk about. Overall, the 802D looks like the Nautilus 802, but the family resemblance is strongest in the massive, teardrop-shaped midrange enclosure, which sits atop the bass cabinet and supports the tweeter tube. Crafted of a mineral-resin composite called Marlan, the extremely heavy, acoustically inert midrange cabinet (finished, like the tweeter nacelle, in high-gloss black) is mounted via a mechanical decoupling gasket. It houses one of B&Ws unique "surroundless" midrange drivers, this one based on a skeletal 6" (150mm) cast chassis and with a woven-Kevlar-in-polymer cone of large diameter (5.5" or 140mm). Most loudspeaker designers assign the midrange duties to drivers that are fundamentally similar to that speakers bass drivers -- and in a two-way speaker, of course, the same driver handles bass and midrange. These drive-units usually connect the cone edge to the driver frame with some form of roll surround, usually made of synthetic rubber, and this fulfills several distinct functions: it supports the cone and keeps it centered while still allowing the cone to move to and fro with sufficient excursion to reproduce bass frequencies, and it terminates the cone edge in such a way as to absorb at least some of the higher-frequency vibrations that are generated by the voice coil and travel out from the center of the cone to the edge. Because B&Ws Fixed Suspension Transducer (FST) driver is used only for the midrange, it doesnt need to undergo significant excursion, so its surround can be specifically tailored to the termination and absorption of midrange frequencies. The cone is no longer physically attached to a surround here, but instead butts up against a thick rubber gasket. This FST driver originally appeared in the Nautilus 800 models, but its magnetic motor, in particular, has since undergone steady development and improvement. Supporting the midrange enclosure in turn is the 802Ds bass enclosure, which also closely resembles that of the Nautilus 802. It is formed from a single piece of plywood more than an inch thick, and while its sides are parallel and at right angles to the front baffle, the rear describes a single continuous curve, considerably improving the stiffness of the whole and helping to disperse reflections and standing waves. These characteristics are further enhanced by B&Ws patented Matrix internal stiffening system: a perforated, honeycomb-like wooden structure that reinforces the cabinet in every direction. The bass is delivered by two 8" cones operating in parallel, together with port loading through a double-flared Flowport set into the bottom of the enclosure. The two woofer diaphragms are made of a new material, Rohacell. According to B&W, Rohacell is "a light, rigid foam which, together with outer skins of carbon fiber, forms a sandwich construction of great stiffness and light weight." Besides ensuring high structural integrity, the relatively thick diaphragms help reduce the escape of unwanted internal box colorations. To keep the port unobstructed and to allow the bass output to travel beneath as well as around the sides of the enclosure, the wood-finished bass cabinet is mounted on a substantial plinth of cast alloy that raises it some 7" above the floor. The plinth is an elegant and functional solution that also provides secure mounting for B&Ws wickedly sharp floor spikes, as well as housing the crossover network and terminals, keeping them well clear of the vibrations and magnetic fields generated by the bass enclosure. If that rundown of the basic ingredients seems unusually detailed and exhaustive, it merely reflects the exceptionally painstaking attention to detail that has been applied to every aspect of this formidable loudspeaker. Add in the fact that the 802D weighs a substantial 176 pounds, and its equally substantial price seems well justified by the engineering. I subjected the B&W 802D to my usual set of basic measurements. I used a farfield in-room technique to measure a sensitivity of around 91dB, a generous figure thats actually a shade higher than the 90dB claimed by B&W. This already good result is even more impressive in view of the 802Ds exceptional bass extension, which registered around 0dB at 20Hz in-room -- thanks in no small part to a very low port tuning frequency of about 23Hz. However, it was rather compromised by a load that will demand plenty of current from the partnering amplifier. B&W specifies the 802Ds impedance as "8 ohms nominal," which is positively disingenuous alongside the admission that the speakers minimum impedance is 3.5 ohms. According to my measurements, the impedance falls to around 3 ohms in the power-hungry midbass region, indicating that the 802Ds nominal impedance is actually around 4 ohms. This will pose no problems for any decent solid-state amplifier, but might give unpredictable results with low-powered, single-ended tube amps -- or, indeed, output-transformerless (OTL) tube amps. These basic measurements might fall a little short of perfection, but theyre nonetheless very impressive. The 802D is undoubtedly intended for free-space siting, but even in my reasonably large room (14 x 18 x 8.5), the low bass (20-60Hz) was a little too strong. The farfield in-room measurements show a tonal balance with a slightly three-humped character: heavy in the low bass, the lower midband a little lean, and the upper mids slightly projected. There was also an obvious if shallow depression through the "presence" region, followed by some recovery as the tweeter took over above 4kHz. Although these ups and downs will impose a degree of character on the sound, the trends are essentially smooth, and the overall balance holds within modest overall limits. The 802D sounded spectacularly good. Though I never got to try the original Nautilus 802, I did spend quality time with both the Nautilus 801 and 800, and found the latter particularly impressive, albeit at a price. The 802D comfortably outperformed the Nautilus 800 in virtually every respect, despite costing considerably less. No doubt the new 800D sounds better still, but the 802D probably represents the better overall value for money in the new range. I did get the chance to compare the 802D to the less costly 803D. The models share the same midrange and treble drivers, but the 803D lacks the separate Marlan head, its FST mid driver mounted in the conventional wooden cabinet. The more traditional-looking 803D was no match for its bigger brother in terms of midrange expression, transparency, and dynamic range. Dynamic range was one of the 802Ds most notable strengths, and the improvements over its predecessors in cleanness and clarity through the bass region were obvious. If the low bass was a little too strong, I perceived this only as a rather satisfying extra weight and scale; the 802D showed no tendency to supply unwanted thump or to thicken sonic textures. The 802D served music with unusually complex bass particularly well; for example, Skuli Sverrissons highly complex and rapid programmed percussion on "My Compensation," from Laurie Andersons beautifully recorded Life on a String [CD, Nonesuch 7559-79539-2]. On a lesser speaker this percussion tends to blur and become confused, but the 802Ds outstanding start/stop abilities beautifully sorted out the polyrhythmic complexities; the whole track consequently made more sense. What of that costly diamond tweeter? A tweeter fills a vital role in supplying nearly all of the delicate fine detail and harmonic structure, but it shouldnt draw attention to itself. In fact, you shouldnt really "hear" a tweeter at all. That, essentially, was the strength of the 802Ds diamond dome. By effectively banishing resonances to well beyond the audioband, the 802D sounded unusually clean and free from any sizzle or hash, and actually made unwanted noise, such as background FM hiss or LP surface noise, sound very discreet, while applause sounded very realistic. No less important, the tweeter integrated beautifully with the midrange driver, temporally speaking -- on vocal recordings, sibilants and consonants sounded beautifully natural and in the proper order. And while the 802D made no attempt to disguise the unpleasantness of bright and aggressive recordings, such as the Chemical Brothers recent Push the Button [CD, Freestyle Dust 5 63303 2], the diamond tweeter did an excellent job of sorting out and portraying the delicate violin and cymbal textures and harmonic subtleties on tracks such as "Neighborhood #4 (7 Kettles)," from Arcade Fires Funeral [CD, Rough Trade 5 98219 2]. Although one can argue that the qualitative differences between the three different diaphragm materials -- diamond, Kevlar, and Rohacell -- might be audible, and that the complexities of any three-way design will also tend to mitigate against overall sonic coherence, I heard little sign of that from the 802D. While the speaker was perhaps not the last word in transparency, its timing was thoroughly impressive throughout, with very little evidence of boxiness or time smear, and transients sounded precise and accurate. The wide dispersion of the separate mid and treble sections had significant implications for the way the 802D interacted with the listening room. A speaker such as the 802D will "read" and incorporate the room much more than more directional designs, such as horn or panel speakers, and while this will tend to somewhat dilute the precision of the stereo image, the fact that the ratio of reflected to direct sound is relatively high also tends to give a greater impression of bringing the musicians into the listening room. This is not a criticism of the imaging capabilities of the 802Ds, which showed fine focus and precision, but merely an observation about room interactions; the choice between these two approaches is ultimately a matter of personal preference. An acid test of any loudspeaker lies in how well it discriminates between the different types of material it is fed, and the 802D was particularly effective at highlighting the different characters of various hi-fi media and the underlying quality of individual recordings and broadcasts. Vinyls innate superiority was obvious, especially with examples of the genre that sound sensationally good, while previously obscure lyrics were made clear and intelligible. The inherent sweetness of FM broadcasts was also evident when listening to the BBCs better-quality transmissions. The 802D was able to make even the most unfamiliar and difficult material, such as contemporary classical and modern jazz, sound more interesting. While the 802Ds slight loss of presence energy was audible, making voices sound a little recessed, it didnt seem to interfere at all with intelligibility, probably because the speakers overall timing was so good. And this did have the advantage of helping the speaker avoid sounding aggressive even while exploring its prodigious reserves of headroom. The B&W 802D might look like its predecessor, the Nautilus 802, but it is a substantial improvement in all-around sonic performance. The 802D delivers massive bass, vivid dynamic expression, tight timing, a fine freedom from boxiness, and an impressively wide dynamic range. B&Ws diamond tweeter is noteworthy for simply getting on and doing its job without in any way drawing attention to itself, and the whole thing comes together with unusually fine coherence for a necessarily complex three-way loudspeaker.